In this solo episode on Creatively Human, I reflect on my first year of motherhood, as my baby boy is turning one next week! I talk about how pregnancy, maternity leave and motherhood in general have impacted my business, and how we are handling things as a family. In this solo episode on Creatively Human, I reflect on my first year of motherhood, as my baby boy is turning one next week! I talk about how pregnancy, maternity leave and motherhood in general have impacted my business, and how we are handling things as a family. I get pretty personal in this episode, and I also want to emphasise that we all have different experiences. As I talk about in the episode, I found myself negatively comparing myself to others a lot in the early days, so please be kind to yourself if you feel that way. 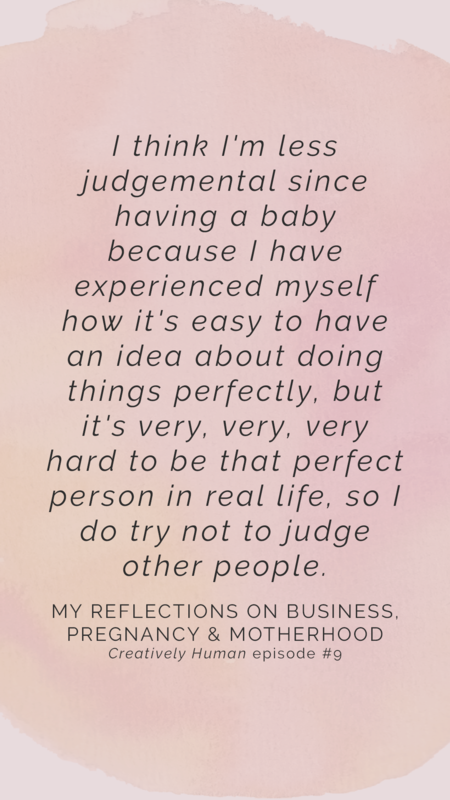 I think I’m less judgemental since having a baby because I have experienced myself how it’s easy to have an idea about doing things perfectly, but it’s very, very, very hard to be that perfect person in real life, so I do try not to judge other people. I guess if there’s one thing to take away from this year of having a baby it’s that I have no idea what I’m doing! No, it’s not that! It’s being kind to myself. Being kind to myself, being kind to other people, knowing that we’re all in this together, and knowing that it’s a massive work in progress. This entry was posted in Creatively Human Podcast, Motherhood & Business, Season 1. Bookmark the permalink.